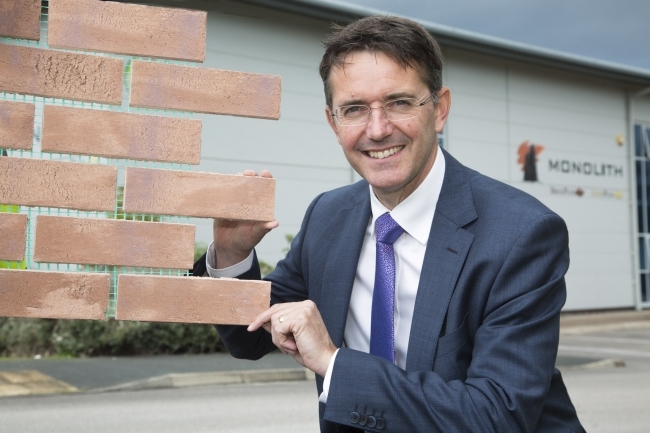 An innovative company is aiming to create 100 new jobs after developing a new building product in the wake of the Grenfell Tower fire disaster. Stephen Waring, the owner of Monolith Brick & Stone in Denbighshire, says they’re fine tuning the pioneering prototype ahead of the official launch in the Autumn. The product created is a panel of 12 brick slips held together by an integrated mesh fused into the bricks. When fitted they provide a non-combustible façade to a building. They fit together like a jigsaw and can reduce labour costs dramatically because they are so quick to apply. The product can be used in the construction of new buildings or applied to existing properties, replicating almost any brick facade to order. Mr Waring revealed there was already much demand from developers, construction firms and public bodies across the UK and beyond because there was nothing like it on the market. Brick slips with a pre-populated carrier integrated within the brick is a first in the construction industry. Mr Waring said: “This new product is timely, and in many ways, was driven by the recent events which happened in London. That concentrated our mind to look at a product which removes the flammable materials that people have been historically using. “Because of the understandable fears and the perceptions about safety following the Grenfell Tower disaster, the availability of this new product will reinforce peace of mind that developers, specifiers and of the course the public are looking for. “We are already seeing much interest because many construction projects have been paused until proper solutions have been found. Nevertheless, from our point of view, it is vitally important we go through our own due diligence processes so it will be a couple of months before we’re ready to launch the new product. “Once we have dotted the i’s and crossed the t’s we’ll be able to ramp up production quickly and if things go as we anticipate we will be creating 100 new jobs during the next 24 months. We are flexible enough in the size of our business to adapt very quickly, because other organisations have such a massive infrastructure, changing is almost impossible. “The one thing that remains, despite the tragedy at Grenfell Tower, is the demand for housing amongst other things, and the demand to create new housing isn’t going away. It’s getting bigger all the time. Safer and innovative time saving products are the real solutions we need to meet the demand in the housing market. “One of the things that has driven Monolith is the fact that we’re able to produce a rapid fit system of populating bricks, or facades on buildings. For example, using our traditional system it reduced the construction time on a student accommodation block in Derby by 18 weeks. Cost savings were enormous. Our new product will give the same time savings and at the same time contribute to a non-combustible façade.